DUGWAY PROVING GROUND, Utah -- Officials of the Dugway Mission and Installation Contracting Command hosted a free vendor event Feb. 23 at U.S. Army Dugway Proving Ground's Community Club to provide information on contracting opportunities for small businesses with the Army Test and Evaluation Command, Installation Management Command and other Dugway organizations. 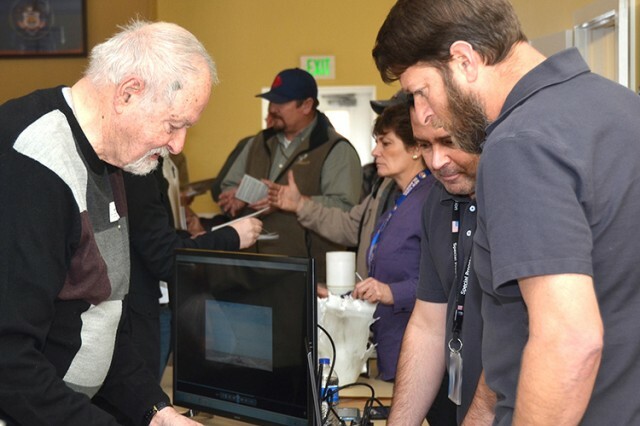 "This is the kind of event that offers an opportunity for small business owners to gain exposure to the test center, expand their prospects for future solicitations and network with other small businesses," said Jim Keetch, MICC-Dugway director, whose office organized and hosted the event. 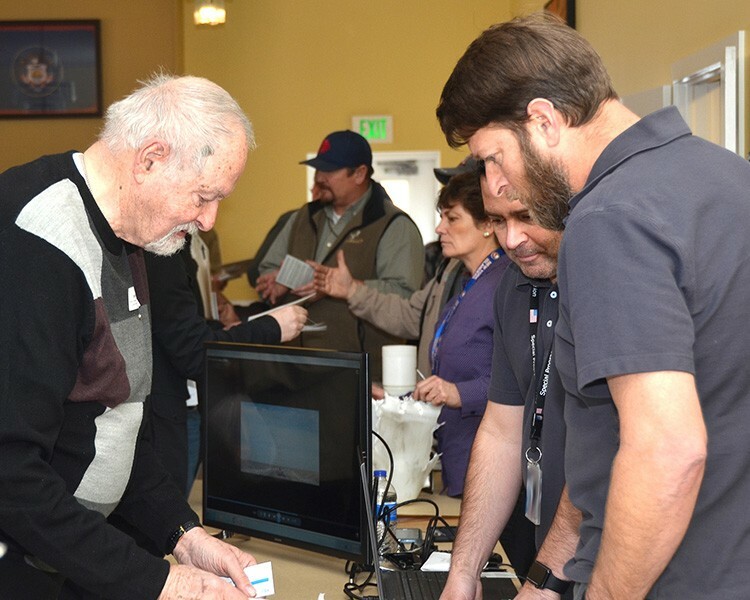 The majority of vendors -- more than 60 individuals -- were from Salt Lake City or various areas along the Wasatch Front from Ogden to Provo, Utah. Other vendors traveled from southern Utah and adjacent western states. Col. Sean Kirschner, Dugway's commander, offered a welcome and thanked attendees for braving a blizzard-like storm that made "traveling the 90-plus miles southwest of the Wasatch Front and beyond more than a bit of a challenge," he said. "We're glad you are safely here." For most attendees, it was their first introduction to the proving ground. Kirschner showed Dugway's command video to explain its role as a Major Range and Test Facility range. 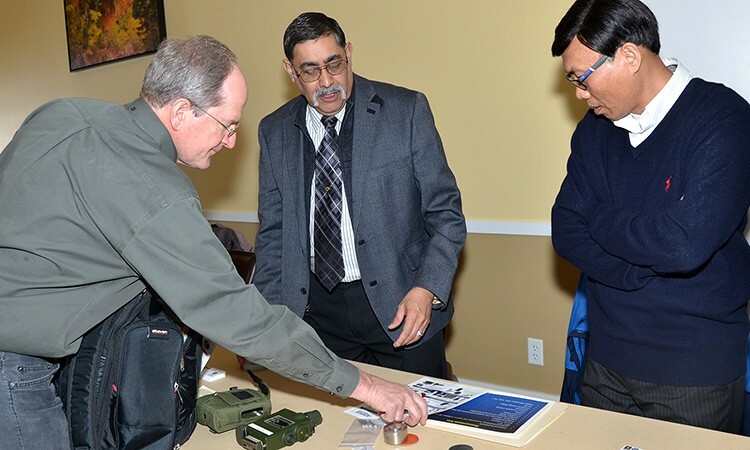 "We specialize in test and evaluation of chemical and biological defensive equipment to protect our warfighters and our nation," Kirschner said. 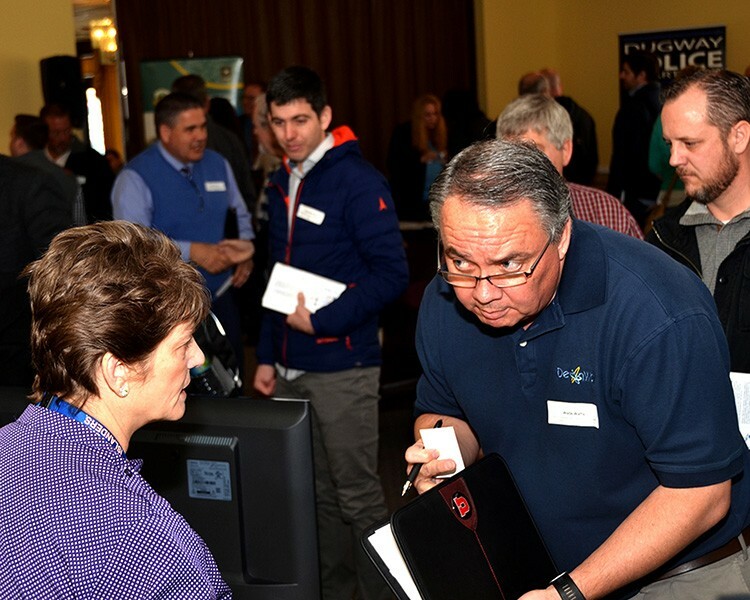 Attendee Emmett Joyner, a general contractor for a nation-wide network of asphalt paving contractors, said he had "no idea of the size or scope of the testing here." "I appreciate that the commander took time to greet us. The video really grabbed my attention," he added. Attendees appeared especially eager to make connections with representatives of the Chemical Test Facilities and the Special Program Division, many waiting patiently in line to talk with the program manager and test officers. .
Special Programs and the Test Management Branch showcased their abilities using videos and displays, which attracted a number of attendees. Many waited patiently in line to talk to Damon Nicholson, a program manager of Test Management Branch and John Gomes, test officer of Special Programs. Nicholson said he was pleased with the event. 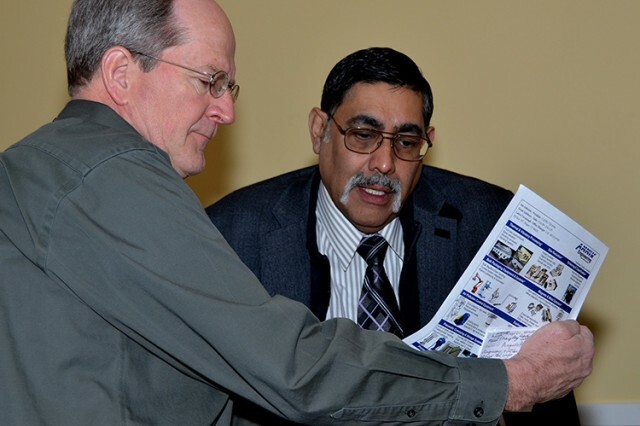 "It helped identify potential vendors. We talked with people about services we might never have known about otherwise," he said. Chase Naisbitt, a chemist with CP Industries of Salt Lake City, said he valued the time to ask questions of test officers who are familiar with working with contractors. "It can be difficult for small businesses, like me, to contact decision makers. This is a terrific opportunity to ask questions and exchange information," he said. 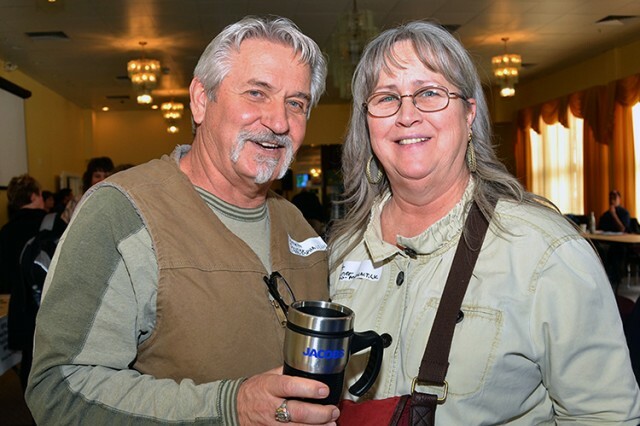 "I have a better grasp of the type of products and services that would be required at Dugway." 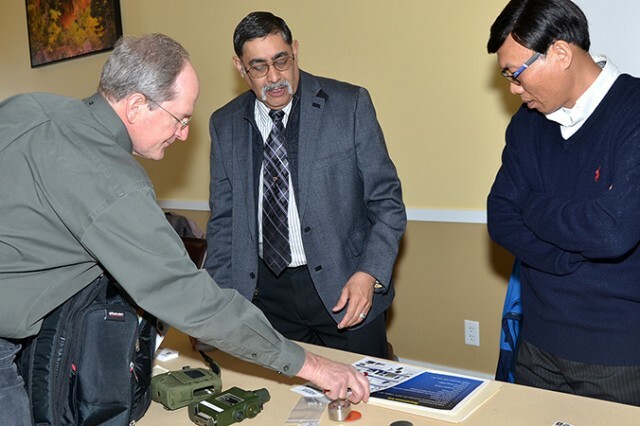 Other attendees focused on meeting representatives from Installation Management Command's Directorate of Emergency Services, the Directorate of Public Works, the Metal Shop and the Family Morale, Welfare and Recreation offices. Moises Cook, of Energy Efficiency Construction located in West Jordan, Utah said he was "pleased to speak with Dugway's Garrison offices" and it "felt like a good fit" for his specialized business. 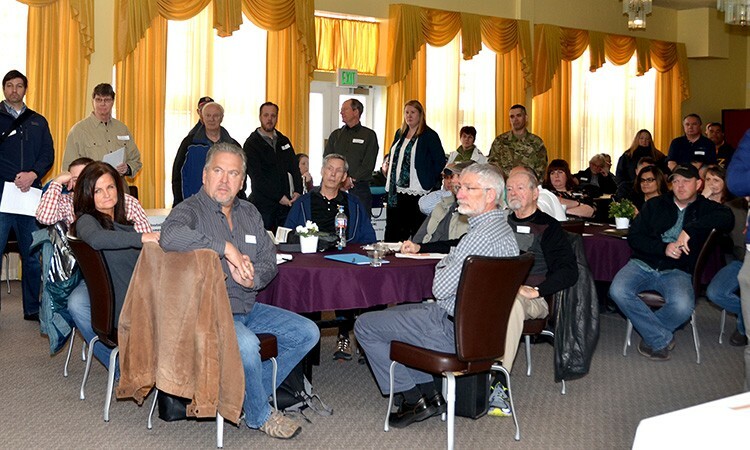 Jim Krulic of SIEGE Enterprises, a service disabled veteran who drove from St. George, Utah expressed his appreciation that the venue offered a place to sit and exchange information with other trades and industries. "You never know where or when an opportunity will present itself," he said. First time attendees were encouraged to register with FedBizOPs the Federal government's internet information network on government contracts over $25,000. By using this network, small businesses can search, monitor and retrieve material about contracts, products and services from the entire Federal Contracting community. The event was also an opportunity for attendees to talk with Small Business Specialist from the MICC Office of Small Business Programs, like Angela Arwood (Galleagos). Arwood was quick to suggest to several business owners that they should add contacts to past profitable performances to strengthen their capabilities statements. "Learning how to navigate the federal contract sites can be daunting," Arwood said. "But an event like this allows businesses a behind the scenes chance to reach out and ask personal questions, something that might be more difficult online." 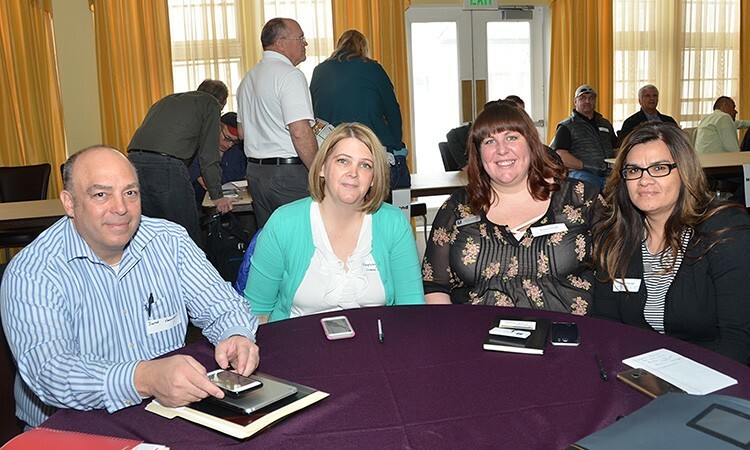 Arwood encouraged small businesses to explore teaming up on a contract when building a performance portfolio. "Working with other small or larger businesses, which are already performing government contracts, allows a smaller business to gain valuable insights, especially if they are new to the federal process," she added. 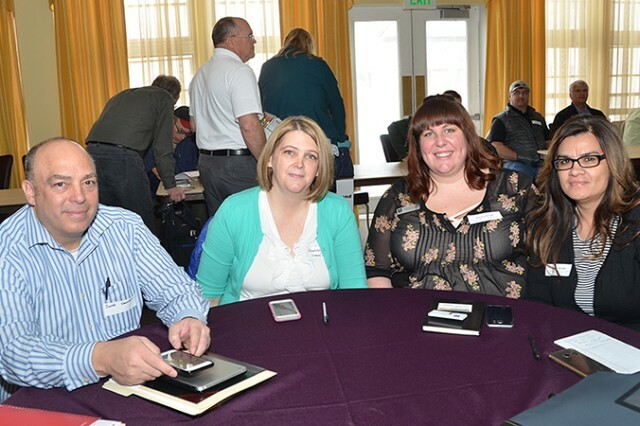 Keith Christensen, deputy director of Utah's Procurement Technical Assistance Center said they unite with Dugway's MICC for two small business outreach events each year, and called it a "beneficial partnership" for all parties. 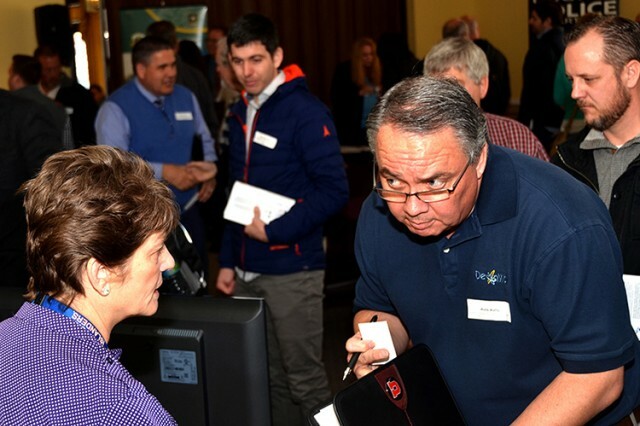 "We are here to help Utah businesses identify contracting prospects and offer technical assistance without a cost," Christensen said. "We want these businesses to grow and succeed. 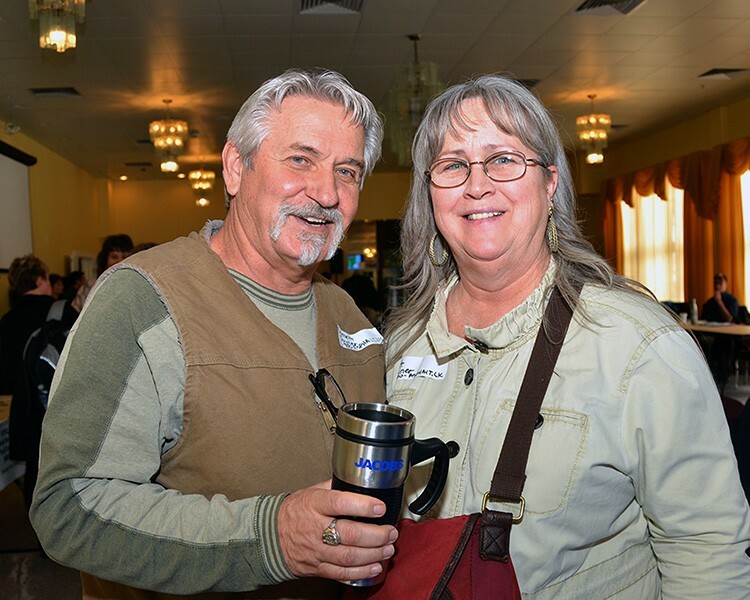 We appreciate all that Dugway has done in hosting this event." In 2016, Dugway MICC awarded $30,883,847 in contracts to small business in professional, scientific and technological services, public administration, waste management, manufacturing, construction, and computer, office machines and other electronic equipment.